The account-based marketing discipline remains hotter than ever, but many companies still struggle with understanding where the practice fits within their business. We asked Matt Senatore, Service Director, ABM for SiriusDecisions, for his insight into how marketers can fit ABM into their marketing plans, as well as the roles predictive analytics and channel partners play in ABM. ABM IN ACTION: How can marketers determine whether they should be doing ABM and where it fits within their marketing plan? 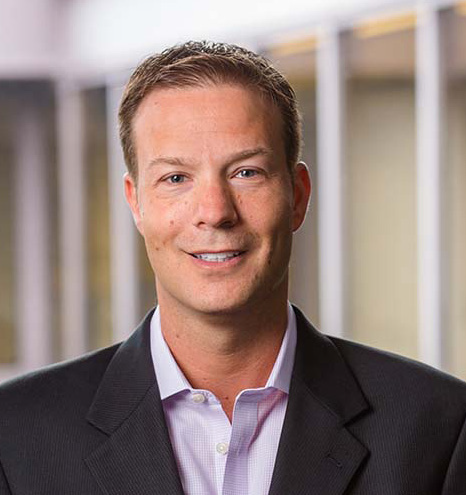 MATT SENATORE: I don’t like to generalize, but almost every B2B marketer should be considering adapting their go-to-market approach to include an ABM strategy. In some instances, ABM just won’t make sense (e.g. highly transactional, little complexity, small deal sizes, little internal coordination needed). However, in most other scenarios, ABM should be considered — especially if you have a selling organization aligned to accounts. Often in these selling models, when ABM is adopted, sales will benefit from marketing support that aligns to the goals they have within the target accounts, bringing a higher degree of alignment and satisfaction. ABM should not be considered a replacement to other demand generation efforts. In most scenarios, organizations should deploy multiple approaches along the demand creation spectrum — from broad-based (market-based) demand to highly personalized, one-to-one ABM. ABMIA: One of your 2017 predictions in our December issue was that predictive analytics is the next frontier of ABM? Tell us why. MS: Predictive analytics is bigger than ABM. There are nearly endless sources of data about organizations, buyers and customers. Predictive analytics brings these various data sources together and applies statistical techniques to turn this seemingly unstructured, unrelated data into actionable insights. As a result, a lot of the guesswork is removed and suppliers are better equipped to develop data-driven strategies for targeted net-new acquisition, appropriate upsell/cross-sell or retention-based efforts. Predictive analytics is still an emerging category, and there’s a lot of work to do. Luckily, there’s significant funding to further develop its capabilities. ABMIA: You also mentioned that ABM is going to expand to channel partners. Can you explain that? MS: ABM has really taken off for organizations that sell directly to customers. But there are many B2B organizations that rely heavily on partners to reach, sell to, transact with and support customers. The principles of ABM must extend to channel partners, as well as to the prospects and customers that we want to win, grow and retain jointly with our partners. For example, if I’m a leading ERP software and services supplier selling to a global consumer packaged goods company that works extensively with a global systems integrator, a collaborative approach between the supplier and that favored systems integrator provides a better chance for winning that deal jointly — and a shorter time to value for the buyer. There’s a lot more to this because whenever you bring another entity into this selling and servicing relationship, it adds more complexity, but it’s very exciting. ABMIA: What do best-in-class marketers or organizations do to operationalize ABM? MS: Our research indicates that best-in-class organizations follow a sequential process and have important foundational elements in place to operationalize ABM. 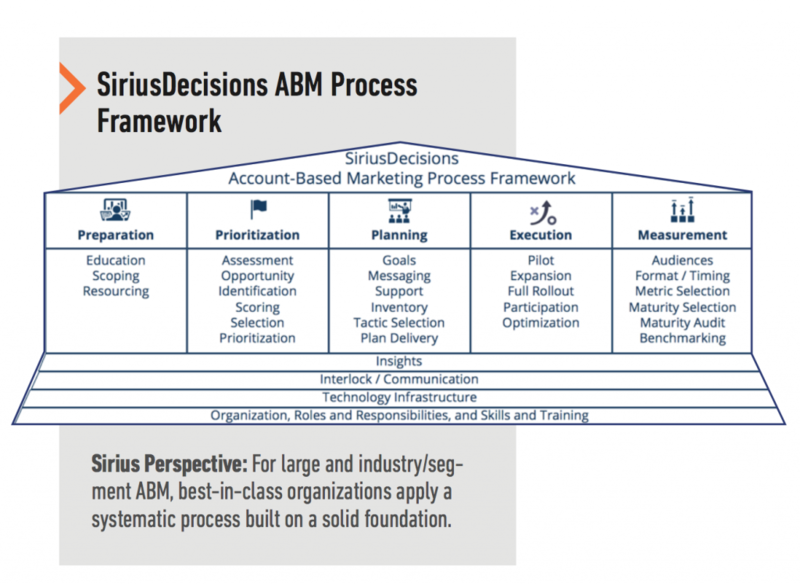 This concept is the basis of the SiriusDecisions ABM Process Framework. We know that ABM is fueled by account and contact insights, so organizations have to leverage this data or be committed to securing it. From a process perspective, an essential first step is [making sure] preparation takes place so marketing and sales leadership are aligned on this different go-to-market approach, the scope of the program is defined, and roles and responsibilities are clearly outlined for the team. This is a situation where “the devil is in the details.” Within each of these stages and foundational areas, SiriusDecisions has a body of research, tools, templates, case studies and data that assist our clients in their journey to adopt, operationalize and optimize their ABM efforts.